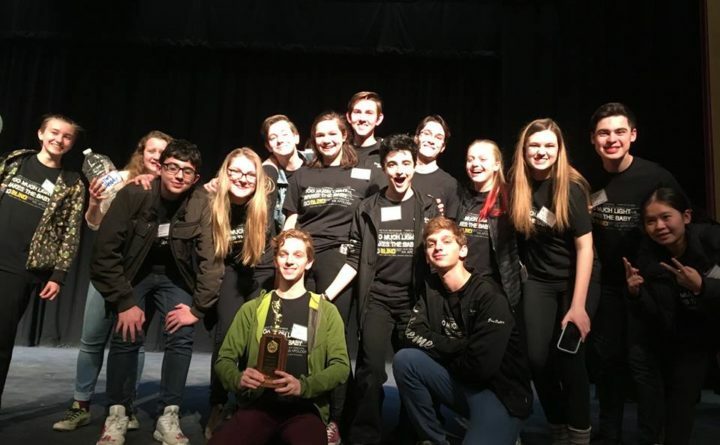 Orono High School's 2019 drama team, winners of the regionals for the Maine Drama Festival this year. The regional competitions for the 2019 Maine Drama Festival — also known as the one-act play festival — were held this weekend in nine locations around the state. Nearly 80 schools and more than 1,000 students participated in the regionals, in which high school theater groups presented a one-act play over the course of the two-day festival. Winners from class A (schools with 550 students or more) and class B (schools with fewer than 550 students) will then go to the state finals. Competitions were held at Brewer High School, Caribou High School, Mt. Desert Island High School, Skowhegan High School, Medomak Valley High School in Waldoboro, Lawrence High School in Fairfield, Bonny Eagle High School in Standish, Mt. Blue High School in Farmington and Thornton Academy in Saco. Class A state finals will be held at Camden Hills Regional High School, and class B finals will be held at Ellsworth High School, both on March 22 and 23. Regional winners will perform the same plays at the state finals. Correction: An earlier version of this report gave the wrong classes Lincoln Academy and Oceanside High School.